This is a great keyboard. it took me a bit to get used to romer-g switches but i prefer them in some ways to cherrys. g1-6 keys are pretty good, though the blue doesn't fit in well as there is no other blue on the keyboard, except for the temporary light when you switch too bluetooth. the included phone/tablet stand is good, if not a little slippery if you have a light phone. hasn't had any malfunctions yet, and the hidden dongle spot is pretty cool. UPDATE 3-13-2018: I have to dock a star off this keyboard. I am on my third one due to the USB receiver going bad. The receivers would not stay connected no matter what port I tried. This happened with both the initial one and the replacement from Best Buy. I didn't dock two stars because Logitech's support answered quick and didn't give me any hassle replacing it. I would recommend this keyboard if you can find it on sale, but if the third keyboard does the same thing, I'll have to come back and say stay away from it. So far I'm loving this keyboard. It's simple and easy to set up. I've never used a mechanical keyboard before but I like the way this feels. And you get the choice of using the LIGHTSPEED connection (the best) or Bluetooth. Definitely highly recommend, especially if you're a couch gamer like me. This is my favourite keyboard I've owned with Logitech romer-g switches. the lack of any wire clutter on my desk is also fantastic. Wireless, slick look and mechanical, a no-brainer. Nice mechanical feel, but could do without some of the extra keys, and miss having backlighted keys. 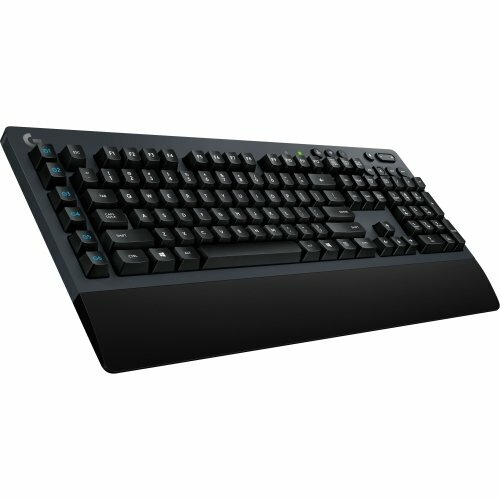 Might change later for Redragon but I wanted a good mechanical wireless keyboard. I liked the idea of a clean desk and this was the only full size, name brand mechanical keyboard without back-lighting available in blue only only. Overall it is quite a large keyboard and the letters on the keycaps are indeed stickers. On the bright side I have been using this keyboard almost everyday for 6 months and I only changed the batteries for the first time last week. This keyboard would be perfect if it has double injected keycaps and some form of back lighting that offers flexibility between build colour schemes. Extremely well designed and SIMPLE wireless gaming keyboard. I love the looks, feel and design. The star off is because it's not backlit RGB and that they used STICKERS to label the key caps. I understand backlit keys would drain the battery like crazy, but I would much prefer this keyboard to have them, and also have an option to be wired if you wanted to.